I’m a 20-year-old half-Chinese, half-Japanese fourth-generation American. And until three years ago, I didn’t know that I was a minority. Growing up in San Francisco, CA, my home life reflected the city’s culture of diversity and acceptance: I was raised in an extended family network of Chinese babysitters with half-Filipino grandchildren; Jewish aunts and black uncles; half-Japanese cousins that spoke Spanish. At school, a majority of my peers were also Asian-American, so I never had to question my place based on race. Yet despite San Francisco’s public “mixing pot” mentality, I discovered how easy it is to assimilate. For various reasons—I speak English at home, I had never been to Chinatown, I listened to “white people music,” and I had inherited my mom’s love of cowboy boots—I became, to my friends and to myself, the stereotypical “white-washed” Asian. When I was accepted to Lewis & Clark College, a small liberal arts school nestled within notoriously hipster Portland, OR, I felt like it was the place I was meant to be. I was thrilled for a fresh start as a Pioneer, and was confident that my open personality and passion for politics would win people over. As I prepared for life after San Francisco, issues of race and cultural communities never once crossed my mind. I failed to recognize my cultural heritage in everyday life, and thus assumed that everywhere else was just as diverse. Fast forward to my first week of college. At home, no one would have been able to identify me by describing me as simply “Asian,” but at Lewis & Clark, there were only a handful of people that matched that descriptor. Soon, I found myself counting the number of Asian-American students I met, and was dismayed that the number could fit on one hand. Looking back, I know that there are many more of us than I realized, but at the time I felt completely alone. Needless to say, my transition into college wasn’t as smooth as I had anticipated. I became homesick and tired of constantly feeling the need to explain my heritage. Even some of my closest friends had never been around Asian people before, and had to be reminded that I didn’t speak on behalf of all Asian people and that, from my perspective, my family wasn’t foreign and exotic. It didn’t make sense to me that here I stood out for being Asian, when at home I stood out for acting “white.” I felt caught in the middle between my Asian heritage, my Americana background, and the stereotype that others expected of me. Finally, I decided that if I was going to be happy and thrive in college, I would need to actively seek out safe spaces. For me, a “safe space” meant a group of people that would accept me as I am, that I could talk to and learn from without judgment. Finding safe spaces isn’t always easy, nor is it always immediately obvious where to go, but it didn’t deter me from finding and creating a place where I felt accepted. Initially, I sought out the Asian Student Union, but I left after the first meeting because it wasn’t the right community for me. At the time, most of its members were international Asian students and I couldn’t relate to their experiences. Disappointed but determined, I joined the Pluralism & Unity Board (PUB), a student-led initiative that brings students together to create open, honest conversations about diversity and inclusion on campus. Since joining PUB, I’ve also become active in the Department of Inclusion and Multicultural Engagement (IME), through which I partake in admissions programs directed towards students of color. This fall, I wrote and presented a race monologue at Lewis & Clark’s annual symposium on race and ethnic studies about my experiences in understanding my heritage and identity. You could say I’ve had a sort of cultural reawakening, a turning point in how I see myself. Speaking out against stereotypes has opened my eyes to the importance of connecting to my roots and advocating for others. I’ve since dismissed my “white-washed Asian” identity because my nuanced background offers so much more than any one label. Over the course of this past year I’ve actively sought to create an Asian-American community. 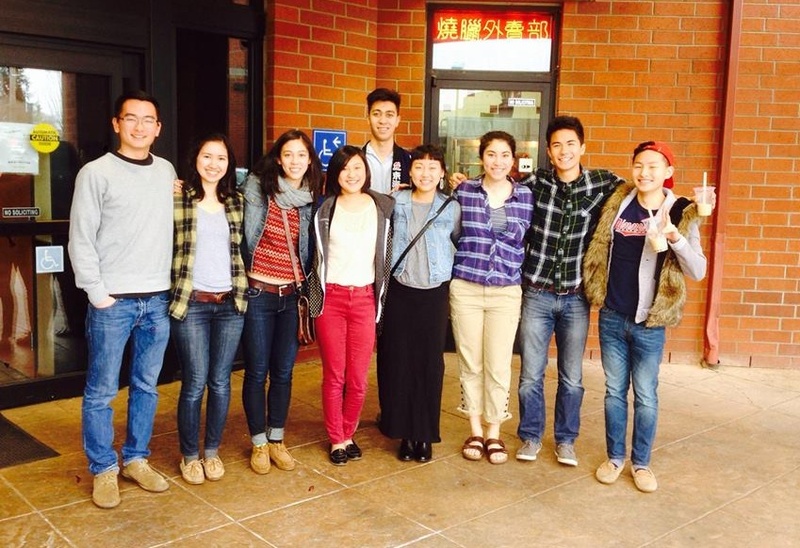 I made friends with a few other Asian-American students, and I realized that I wasn’t alone in my desire. In the spring, my friends created a Facebook group for our other Asian-American friends. It’s not an official student organization, nor is it an exclusive social clique; simply, it’s a place for Asian-American students to connect. It’s the safe space I had been looking for. At our first unofficial event, eleven of us piled into a minivan and went out for bubble tea (a Taiwanese dessert drink) and dim sum (Chinese dumplings served à la carte). On the way, the car was filled with excited shouting. Some of my friends who weren’t from heavily Asian populated areas like San Francisco had never been around this many other Asian-American friends, but to me, it felt like home. I could tell that a huge weight had been lifted from my friends’ collective shoulders, because we all knew that we could just be ourselves. The best part about this group is seeing the freshmen get excited to hang out with us. Not only have I been able to create the community that I needed, but I helped create it for someone else as well. This fall, I will be a junior at Lewis & Clark. As an upperclassman, I look forward to helping the freshmen I meet, even if ‘helping’ just means being visible to the few who, like me three years ago, may be secretly counting the number of Asian-American students they see. However, unlike three years ago, there is now a budding Asian-American student community to be there when those students feel alone. It may not seem like much, but the simple act of going out for dumplings and comparing family traditions can be huge for someone who feels like no one understands them. I've learned many things in college, but the most valuable thus far has been the importance of community. Finding your niche on campus and in the world is a constant journey, but it's not one that you need to take alone. Karissa Tom is the summer social media intern at Not In Our School. She studies Sociology and Anthropology at Lewis & Clark College.